The back-lock folder by Koji Hara. 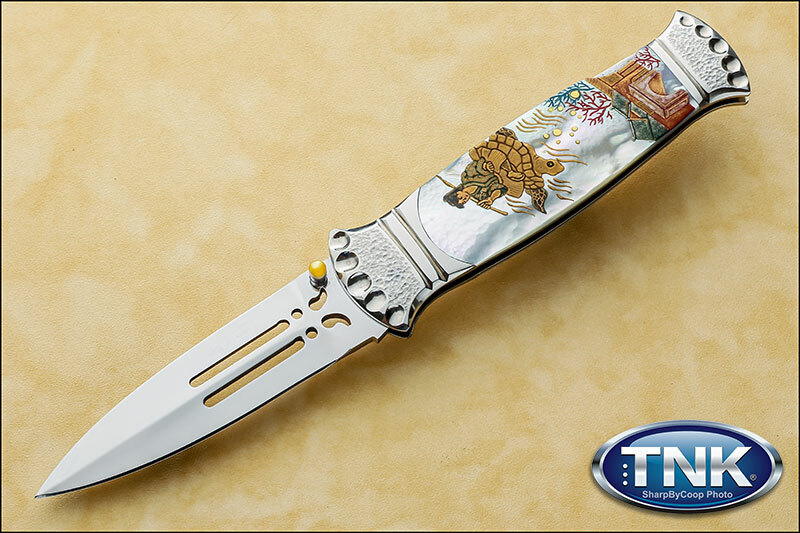 It features a mirror polished Cowry-Y steel double edge dagger style blade and integral stainless steel with hand-dimpled and polished grooves with perfectly shaped and polished mother of pearl in the handle. The blade is cut out in this shape of "GOMA-BASHI". GOMA-BASHI is Tai Kok chopsticks made with cedar sapwood to be used with burn small pieces of wood on the altar to invoke divine help to pray for such good health and fertility, carved on blade of Japanese sword. The story of Urashima Tarō is drawn by Maki-e on the mother of pearl both side by traditional Japanese Maki-e artisan. Urashima Tarō (浦島 太郎) is the protagonist of a Japanese fairy tale (otogi banashi), who in a typical modern version is a fisherman who is rewarded for rescuing a turtle, and carried on its back to the Dragon Palace (Ryūgū-jō) which lies beneath the sea. Comes with Kiri wooden box that keeps and displays the knife in open position. Japanese lacquer sprinkled with gold or silver powder as a decoration using a makizutsu or a kebo brush. The technique was developed mainly in the Heian Period (794 -1185) and blossomed in the Edo Period (1603-1868). Maki-e objects were initially designed as household items for court nobles; they soon gained more popularity and were adopted by royal families and military leaders as a symbol of power.